I always put house training at the top of my list of priorities with any new puppy because if done right, it can be accomplished in a few weeks, then it’s over forever. No, it’s not fun but if you can put in the time and effort (and get a little less sleep) now, you’ll be done with this sooner and have a great dog to show for it. Just remember, there is no short cut and that everyone with a puppy has to go through the same process. Some puppies are easy and some will be quite a challenge but the process is always the same. The more you can stick to the plan, the quicker this will happen. Giving the dog too much freedom is a surefire way to set him up to fail. I like to keep the puppy’s world small and slowly expand it as they learn the rules. Too many people give their new pup the run of the house with very little direction, then wonder why their house smells like a urinal. Supervision is critical for house training as is helping the dog learn how to live in this very human world. You want to set him up to succeed and can do that only if you show him exactly what you want him to do every step of the way. Left to his own devices, your puppy is going to make decisions like a dog, and those decisions are probably not going to be the same decisions that you would prefer him to make. So it’s your job to teach him how to fit into your world and to learn the rules of being a dog in a human world. Dogs don’t come pre-loaded with the knowledge of where to pee and poop. They will only learn if you teach them. Add up all of the time your puppy spends outside in an average twenty-four hour period, what would it add up to? If you’re like most people it will add up to maybe two hours or so. That means that for two hours a day your puppy has the opportunity to go to the bathroom in the right place, and for twenty-two hours a day, the opportunity to do it in the wrong place. Think about that for a minute. The odds of him ever getting it right are astronomical – most of the time he’s in the wrong place. You need to properly manage those twenty-two hours your puppy spends inside so that you can effectively steer him to the right place. The crate is the most powerful tool with house training, because if done correctly, it becomes a den, and dogs have a natural instinct not to pee or poop where they sleep. For the crate to become a den, it can’t be too big. In fact, it should be just larger than the dog. The crate can’t be big enough to where the dog can comfortably pee in one corner and sleep in the other. Big crates for large dogs come with a divider that can and should be used to make the crate smaller, expanding the crate as the dog grows. If the crate is the right size, and your puppy hasn’t gotten into the habit of going to the bathroom in his crate (common in most dogs purchased from a pet store) then the crate becomes your safe place: a place where you can put him and be confident that he won’t pee because he does not want to pee in his den. The more organized you are the easier this process will be. Here’s how I would lay out a potty training plan for each day. First thing in the morning (assuming your pup hasn’t gone to the bathroom in his crate overnight), take the puppy out of the crate and carry him (pick him up – don’t let his feet hit the ground) outside to the same spot every time. Once he pees, praise him. I don’t use treats because your timing has to be perfect, which very few people do, and all puppies love praise and affection. Then go back inside for supervised free time. By “supervised” I mean eyes on the dog at all times. If you can’t see him, he’s getting into trouble, guaranteed. And you can’t correct what you don’t see, so if you find a puddle but didn’t see your puppy do it, you just clean it up and smack yourself in the face for not supervising. If you do happen to catch him in the act of going in the house. Make a noise (“Hey!”) loud enough to startle him but not too loud that you scare him. Pick him up and take him outside. Odds our his little bladder has emptied already. However, if he does finish up you throw a party for him. That’s it that’s all you do. Nothing more. No sticking his nose in it, no yelling or giving him a time out. Okay, after a little while it’s probably time for breakfast and water. 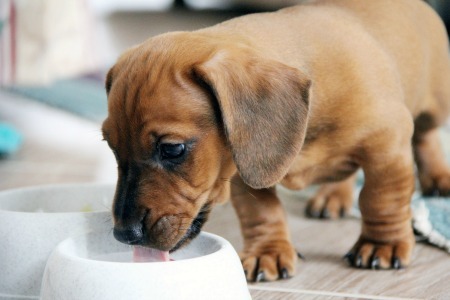 I usually recommend feeding a puppy three times a day until they are six months of age, and then feeding twice a day (although some people will choose to feed once a day). The good news is that puppies are very predictable: what goes in will come out. And the younger the pup, the more you can set your watch by it. If an eight week-old puppy takes one sip of water, it’s coming out in about 10 minutes. The older the dog, the longer they can hold it, but if food or water went in, it’s coming out. One of the biggest mistakes that people make is not monitoring water. If your take your pup out, he pees, then you come back in to the house and he takes a big drink of water that you doesn’t notice, he’s going to pee again very soon. This is why supervision is so critical. You need to know exactly what’s going into your puppy and when, so you can take advantage of the times he probably has to go and get him in the right spot to do his business. Give him food and water, then wait anywhere from ten to thirty minutes, depending on the age of the dog, and bring him outside again. If he goes, praise him and he’s allowed more supervised free time inside, because we know his tank is now empty. This works very well for pee, but poop can be a little more difficult to predict. Most dogs will poop one more time per day than they eat. So a puppy that is fed three times a day will, on average, poop four times a day. Keep this knowledge in mind if it’s late in the day and the pup has only pooped once. Odds are, he’s got one on deck, so you will need to make sure to keep bringing him outside. A good gauge to go by is how ever many months your puppy is that’s about how many hours they can hold it in. So a three month-old dog can hold it in for about three hours. If we make him wait any longer, it’s our fault. The exception to the rule is overnight, when he’s inactive and not getting any food or water. Okay, back to our puppy: He’s now been fed, peed and pooped outside, and is playing inside. If you ever think, “I wonder if he has to go out?” take him out. You can’t take him out too much at this point. When in doubt, take him out. If get to a point where you think your puppy should have to go, take him out. If he does, praise and allow more supervised free time. 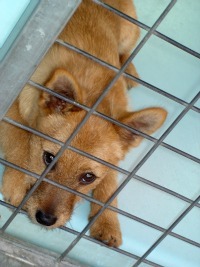 If, however, he does not go, you need to crate him when you get inside – even if you want to play with him. Wait for a little while (twenty to thirty minutes) and take the pup back outside. If he goes, he’s allowed supervised free time; if he doesn’t, back in the crate he goes. Keep cycling him from crate to outside until he finally goes outside, at which point he’s allowed more supervised free time. If he didn’t go outside and you know he has to go soon, he needs to go into the crate, because he innately doesn’t want to go to his crate. This is making it very difficult for him to make a mistake. Continue this schedule throughout the day: outside, pee, poop, praise and then supervised free time. If at any time he doesn’t pee outside, he goes back and forth from the crate to outside until he goes, then he’s allowed free time. 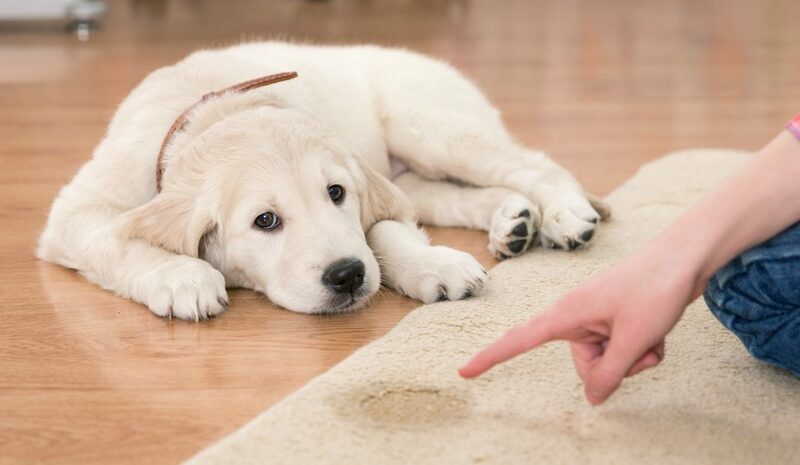 Most problems occur in the house training process because the owners are not supervising, giving too much free water, or are not using the crate correctly. Then the last thing you do before you go to bed is go out for a quick squirt. I usually also recommend no water after 8pm to make sure he’s empty over night. Put him to bed in his crate and get some sleep. Now if you have a young pup (7 – 10 weeks of age) I would recommend you set your alarm and get up in the middle of the night because you don’t want to force him to go pee in the crate because if we lose the crate as our safe place this gets very tricky. If someone in your family goes to bed late and another gets up early, then you might experiment with not getting up in the middle of the night. 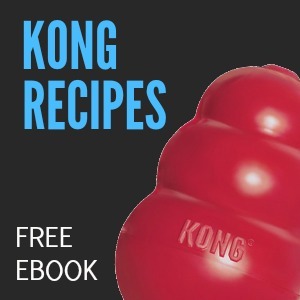 There’s no way to really know, just experiment to see what your puppy is capable of. If you have to leave your puppy alone for longer than he can realistically hold it in, you don’t want to leave him in a small crate, forcing him to pee and sit in it. That’s unfair to him and will create some bad habits. If you have to leave for extended periods of time, you should either hire a dog walker to come in or create a long term confinement area. If possible but them in a pen or small room with open crate on one side and some pads or newspaper on the other (directly opposite the crate). Dogs will prefer to go as far away from their sleeping place as possible. For dogs that have been peeing and/or pooping in the crate, you might want to try feeding them in the crate. This increases the den-like atmosphere – dogs don’t want to pee where they sleep or eat. Teaching your puppy where to go the bathroom is our responsibility and if we don’t intercede he’s going to make it up on his own and you’re not going to like that. So put in the effort now, get organized and get this over with asap. The less you’re cleaning up messes the more you’ll be able to enjoy your pup. Whenever I get called to do a session for a dog over 5 months old who isn’t potty trained it’s always because of one of two reasons. Either they just don’t know what their doing, or they know but just don’t feel like doing it. That’s it. To help you stay on track I’ve created a PDF file that you can print out and hang up to remind you of the key points to house training success. CLICK HERE to download and print. Good luck and here’s to a dry house.